Whiplash injury is a term used to describe an acute cervical sprain or strain that results from acceleration and deceleration motion without direct application of force to the head or neck. Whiplash commonly affects the cervical facet joints and related musculature (trapezius, levator scapulae, scalene, sternocleidomastoid, and paraspinals). Although the symptoms of nonradicular neck and shoulder pain are often self-limiting (6-12 months), many people continue to experience more chronic symptoms. Treatment options include cervical traction, massage, heat, ice, ultrasound, isometric neck exercises, a soft cervical collar, and NSAIDs and or short-term analgesic use. Patients with persistent pain may have annular tears, coexisting degenerative joint and disc pathology, nerve root entrapment, spinal stenosis, or myelopathy. Neurologic symptoms or intractable pain symptoms that are not responsive to treatment indicate the need for further evaluation. Indications for surgical treatment of patients with axial neck pain are uncommon. Surgery may be indicated for conditions such as instability, posttraumatic facet injuries, and C1-C2 osteoarthritis. Patients with discogenic-mediated neck pain secondary to degenerative disc disease can occasionally be treated surgically. Whitecloud has shown that 60 to 70 of patients improve following anterior discectomy and fusion. Before surgery, patients are evaluated by provocative cervical discography to confirm the source of pain. Poorer results are seen in litigation cases and cases involving more than two cervical levels. Was the neck forced into back bend- The athlete is hit from behind the head remains still while ing then forward bending (whiplash) the body accelerates forward. The cervical spine is forced into (Fig. 2-10) excessive back bending that can be coupled with rotation The whiplash mechanism can subject the brain to a contrecoup phenomenon (the brain moves forward and backward in the cranium and trauma to the cortex or cerebellum can result). A full concussion evaluation should be done if a whiplash mechanism occurs. Fig. 2-10 Whiplash mechanism. Cervical back bending then forward bending. Fig. 2-10 Whiplash mechanism. Cervical back bending then forward bending. Whiplash is a term first used in 1928 (Crowe, 1964a, 1964b) that describes the typical hyperextension followed by flexion of the neck that occurs when the occupant of a motor vehicle is struck from behind by another vehicle (Evans, Evans, & Sharp, 1994). Although neck injuries do occur following side or head-on collisions, approximately 85 of whiplash injuries occur as a result of rear-end impacts (Deans, McGalliard, & Rutherford, 1986). Some days, when the pain of a headache gets bad, do you feel like unscrewing your head and asking for a refund Hopefully you won't need to do that after reading this chapter on pain from the neck up. We'll be discussing some of the most common pains that occur above the neck, and then look at the ways that oriental medicine identifies what's going on and treats it. Headaches, dental and neck pain, and fibromyalgia are open for your examination. So hold onto your hat (and your head) while you learn valuable tips for taking the dread out of your head. Now that youVe got the top part of your body in better shape let's move on to the rest. I have always felt it's better to have options in treating conditions such as headaches, dental, and neck pain. Fibromyalgia has also responded so favorably to treatment that I had to include it in the text. Go ahead to the next chapter to begin experiencing the relief for some of the most common shoulder and joint pains. 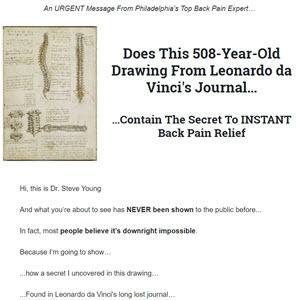 V Say no way to neck pain through acupressure. Soft tissue sprain or strain (muscle, tendon, ligament) is the most common disorder responsible for low back and neck pain. This diagnosis is generally based on clinical assessment without the need for interventional procedures. Frequently, the diagnosis of soft tissue sprain or strain is made by exclusion of more serious pathology and may alternately be described as nonspecific back pain syndrome. Facet joints (zygapophyseal joints or z-jointS) are paired synovial joints in the posterior column of the spine, which are innervated by medial branches of primary dorsal rami. Lumbar facet pathology may result in referred pain involving the buttock, groin, hip, or thigh. Cervical facet joint pathology can manifest as neck pain, referred pain involving the scapular area or headaches. If patients develop neck pain as a result of one of the systemic arthropathies such as RA or AS, they will generally have had symptoms for many years (Maghraoui et al. 2003). 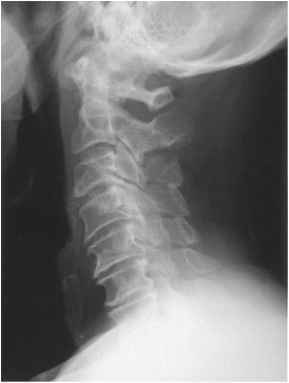 The cervical spine is an unlikely site for onset of symptoms, and the patient will generally be aware of the diagnosis. In patients with RA, neck pain has been reported in 40 - 88 cervical subluxations have been observed in 43 - 86 and neurologic deficit hasbeen reported in only 7 - 34 (Pellicci et al. 1981). For dizziness to be deemed cervicogenic in origin, the onset and duration must parallel the neck pain and must be associated with neck movements. If with further questioning any of the symptoms listed in Table 8.4 are reported, pathology of the central nervous system should be suspected, further treatment is contraindicated and the patient should be referred to the appropriate specialist. See next section for fuller discussion about dizziness. Shoulder pain can frequently mimic cervical disorders. Careful examination of the shoulder joint should always be performed in a patient presenting with neck pain. Diagnostic injection into the subacromial space and the acromioclavicular joint can differentiate pain originating from the shoulder region from pain originating in the cervical spine. 4. Carragee EJ, Hurwitz EL, Cheng I, et al. Treatment of neck pain injections and surgical interventions Results of the Bone and Joint Decade 2000-2010 Task Force on neck pain and its associated disorders. Spine 2008 33 S153-S169. At this time the soft cervical orthosis can be removed and gentle active ROM initiated. Cervical isometric neck strengthening exercises may also be started. With continued clinical improvement, functional and sports-specific exercises are introduced. Although commonly prescribed, the use of a soft foam cervical orthosis is controversial. In 2000 and 2003, Rosenfeld et al. published two articles that compared active neck exercises without cervical orthosis with a protocol involving rest, soft collar use, and self-mobilization these studies were performed in persons who had suffered whiplash injuries. The authors found that the patients whose clinical course did not involve orthosis use had less pain and fewer lost days from work. Transient tetraplegia most often results after an impact forcing the cervical spine into hyperextension, hyperflexion, or axial loading. Affected athletes experience tetraplegic symptoms of relatively short duration that include dysesthesias, and or weakness in both arms, both legs, or all four extremities. Individuals do not generally complain of neck pain. The clinical symptoms last for as short as 10-15 minutes and as long as 48 hours. The patient regains full function and ROM and radiographs show no evidence of fracture, but these players often have cervical canal stenosis. In individuals with a narrowed canal in the AP diameter, the pathophysiology is thought to be as follows. Hyperextension or hyperflexion of the cervical spine causes further narrowing of the canal with compression of the cord against adjacent bony or ligamentous structures. Torg et al. found the incidence of transient cervical cord neurapraxia with transient tetraplegia to be 7 per 10,000 football athletes. Advice concerning neck care in the future is always given to the patient during the treatment episode and prior to discharge. This should include discussion of the following aspects recurrent nature of neck pain, avoiding prolonged aggravating postures, practice of prophylactic exercises and importance of general fitness. use of exercises if neck pain re-occurs. A 63-year-old female presented to clinic with an 8-year history of worsening neck pain radiating to her bilateral shoulders and scapulae. The pain radiated primarily down her bilateral biceps and radial forearms into the thumb and index fingers of both hands. Additionally, she had noted a gradually worsening weakness in her legs, with loss of balance, worsening handwriting, and difficulty buttoning buttons and manipulating small objects with her hands. She had no bowel or bladder dysfunction. Despite nonoperative management that included activity modification, physical therapy, and nerve root and trigger point injections, her symptoms persisted and seemed to be worsening. When severe neck pain or Significant trauma marked the onset of this episode some time will have elapsed at least six to eight weeks is probably necessary to allow dysfunction to develop. They may report involvement in a road traffic accident in the past. Since the onset the pain has eased considerably, but is now unchanging. When the onset has been insidious, the patient will be older, poor posture will be obvious, there may be an episodic history of neck pain in the past, and symptoms and functional impairment may well be worsening gradually over time. one exception, all dysfunctions present with local neck pain only this may be symmetrical, unilateral or asymmetrical. Stage II of Lyme borreliosis may involve the neurological system. Of patients, 10 to 15 percent may have this involvement and present with a meningitis-type picture or have cranial nerve palsies. The most commonly involved cranial nerve is the seventh (facial) nerve, which results in an inability to control properly the facial musculature. In individuals with meningeal irritation, episodic headaches, neck pain, and stiffness may occur. Cerebrospinal fluid analysis frequently shows a predominance of mononuclear white blood cells. Occasional patients with stroke syndromes including hemiparesis as well as cases mimicking multiple sclerosis or encephalitis have been reported. Individuals may have associated confusion, agitation and disorientation, and memory loss. The symptoms and signs may wax and wane over weeks and months. Neck pain may be the first clinical symptom of a slowly growing acusticus neurinoma, with absent corneal reflex being the first sign. Patients with referred pain in the region of trigeminus nerve pain commonly present an underlying pathology of the upper cervical spine, often observed in at-lanto-axial instability due to rheumatoid arthritis 38, 42 . ATLS also calls for flexion projections of the cervical spine under supervision of an experienced doctor, prior to full 'clearance' of the spine in patients who are alert and neurologically normal but suffering neck pain. Flexion of the spine in an injured patient should be undertaken only under medical supervision. In elderly patients who complain of slowly increasing pain which occurs also during sleeping in the low back region, gluteal region, groin, knee, or generally in the lower extremity, may have a hip or knee problem, however, remain suspicious for a metastatic bone cancer, specifically if they have a tumor history or clinical signs of a consuming disorder. Also newly appearing neck pain in an elderly person should be taken seriously by the first consulted physician and not just automatically considered as an expression of a degenerative cervical spine disease. Crescendo orbital pain or frontal headache can herald impending internal carotid artery occlusion presumably from irritation or ischemia to peripheral trigeminal branches. Similarly, a cluster of symptoms including facial, orbital, or neck pain or facial paresthesias in association with an ipsilateral Horner's syndrome may reflect dissection of the cervical portion of the internal carotid artery. y These symptoms may also be prodromal. Excruciating pain in the supraorbital headache in association with a pupil involving third nerve palsy is almost pathognomonic for an intracranial (especially posterior communicating artery) aneurysm. Ipsilateral orbital or ocular pain has also been reported in association with posterior cerebral artery occlusion, which may reflect ischemic damage to regions of the tentorium adjacent to the occipital lobes that are innervated by V1. Painful thyroiditis occurs more commonly in women (malefemale ratio of 1 3 to 1 6) between 30 and 40 years of age. It is characterized by the sudden or gradual onset of unilateral or bilateral pain in the neck, which may radiate toward the mandible or ear and is exacerbated by swallowing or neck movement. Many patients report a preceding upper respiratory tract infection with low-grade fever, neck pain, dysphagia, and flu-like symptoms with malaise and myalgias. Two items of history are important in helping to determine the source duration of episode and frequency of symptoms. If neck and arm pain are of recent onset, only derangement or stenosis need be included in the differential diagnosis. An adherent nerve root is a secondary product of derangement or some other trauma and takes time to form. Dysfunction of adherent nerve root is unlikely unless two to three months have passed since the beginning of the episode. Onset of the episode is from the time arm symptoms started, not simply neck pain. neck pain only. Neck pain and headaches associated with tightness in the posterior neck muscles are most often found in patients with a forward head and a round upper back. As shown on pages 152 and 153, the compensatory head position associated with a slumped, round upper back results in extension of the cervical spine. This second edition of The Cervical Thoracic Spine Mechanical Diagnosis Therapy parallels the changes in the updated Lumbar Spine text. It has been thoroughly levised and considerably expanded and explores in depth the literature relating to mechanical syndromes and neck and trunk pain in general. Theie are descriptions of the management of the three mechanical syndromes - derangement, dysfunction, and postural syndrome - as applied to neck, thoracic and headache problems. There is in-depth consideration of the literature relating to a number of issues, such a the epidemiology of neck pain, headaches, serious spinal pathology and whiplash. Operational definitions, descriptions and numerous tables provide clinical signs and symptoms to recognise or suspect mechanical syndromes or other diagnoses. The incidence of neck pain after lamino-plasty is reported to be high, and this is one of the most discouraging complications 11 . The pathomechanism of postoperative neck discomfort has not yet been clarified, although several hypotheses have been advocated such as prolonged neck immobilization, facet joint damage, and nuchal muscle damage. A couple of days after surgery, patients are allowed to leave bed without wearing a collar. 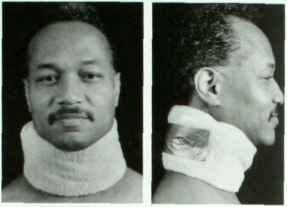 When a patient complains of neck pain, a collar is recommended until the patient can stand the pain. If a patient does not feel pain, a gentle active ROM exercise of the neck is recommended. Three weeks after surgery, isometric neck muscle exercises are started. 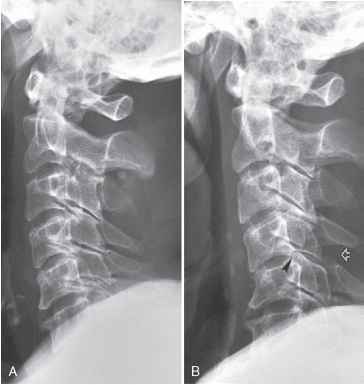 When spinal fusion is required, immobilization of the neck with the collar should last until consolidation of the graft is confirmed roentgenographically. Nerve blocks with local anesthetic or neurolytic agents are helpful in managing intractable pain. 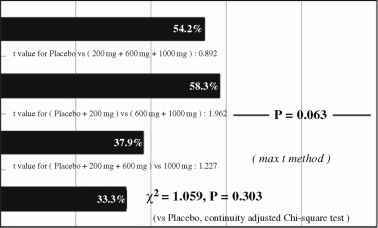 It is generally agreed that 50 to 80 of patients receive benefit from single or repetitive blocks. Nerve blocks for pain may be used diagnostically to determine the pain generator, prognostically as outcome indicators of neurolytic procedures, or therapeutically for peripheral or central blockade. Blocks used by anesthesiologists for the relief of pain include blocks of the trigeminal system for relief of head and neck pain blocks of the cervical, thoracic, lumbar, and pelvic sympathetic nervous systems blocks of spinal nerve roots, and nerve plexus blockade. 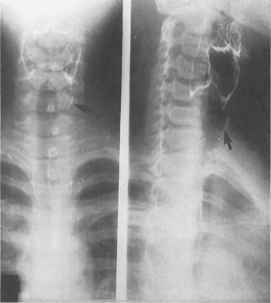 Ossification of the posterior longitudinal ligament (OPLL), considered to be one of the clinical manifestations of a generalized disease, diffuse idiopathic skeletal hyperostosis (DISH), appears as an abnormal radiopacity along the posterior margins of the vertebral bodies on lateral-view radiographs 1 . Most patients with OPLL have only mild, subjective complaints such as neck pain and numbness in their hands. However, some patients develop myelopathy, including gait disturbance and clumsiness of the fingers and they undergo surgery when their symptoms are aggravated. Further understanding of cervicogenic dizziness comes from treating dizzy patients without headache and cervicogenic headache patients without dizziness. The disorder is suggested by not meeting IHS criteria for either cervicogenic headache or migraine. A spectrum of improvement was seen with greater occipital nerve injections for patients with dizziness and headache, including relief of symptoms of ear discomfort, tinnitus, and neck pain, along with improvements in the headache and dizziness. Cervical radiculopathy is a common diagnostic issue when the diagnosis of CTS is under consideration. Patients with radiculopathy are more likely to report neck pain, radiating pain with coughing or sneezing, and daytime (as opposed to nocturnal) paresthesias. With C6 or C7 radiculopathy, the biceps or triceps tendon reflex may disappear. Sensory loss proximal to the wrist is not characteristic of median neuropathy. A theory that proximal compression of a nerve root will worsen distal entrapment by impairing axonal transport (the so-called double-crush syndrome) has not been proved. y Most investigators believe that in patients with two sites of compression, for instance, C6 radiculopathy plus CTS, the disabilities are purely additive. The key to safe strengthening is the ability to maintain the spine in a safe, neutral position during the strengthening exercises. For upper body strengthening, the spine must be well aligned with the chest-out chin-tucked posture. 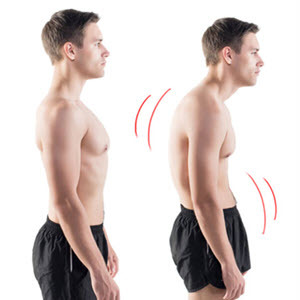 Doing isometric trunk exercises and upper body exercises emphasizing this chest-out chin-tucked posture will strengthen the support of the cervical spine, strengthen the postural muscles necessary for maintaining proper body alignment, and prevent neck pain due to athletic activity. Neck pain Axial loading Apply a few pounds of pressure to the top of the patient's skull with your hands (Fig. 10.9). This often produces neck pain, which is physical, but to test the lower back you can then repeat the test on the shoulders. Low back pain on axial loading is surprisingly rare even in the presence of serious spinal pathology. If axial loading produces low back pain in a patient with ordinary backache or root pain, it is behavioral. In an audit of mechanical diagnosis that included seventy-eight neck pain patients, sixty-two were classified as derangement, of which less than 5 were deemed to be irreducible (May 2004a). These patients generally have symptoms of constant brachialgia accompanied by nerve root signs and symptoms - this group will not respond to mechanical therapy Again, aspects ofthe history and physical examination provide clues that a patient may have an irreducible derangement (see Table 17.12). Blanchard and colleagues (Blanchard, Hickling, Taylor et al., 1996) noted in their study of 158 MVA victims assessed one to four months postinjury, 62 (39 ) met the DSM-III-R (APA, 1987) criteria for the diagnosis for PTSD. They found that 70 of the participants could be classified as PTSD sufferers (or not) based on four variables prior major depression, fear of dying in the MVA, the extent of the physical injury, and whether or not litigation had been initiated. Eight variables including the presence of litigation, prior mood disorder, fear of dying in the MVA, ethnicity, road conditions responsible for the MVA, extent of injury, prior history of PTSD, and the presence of a whiplash injury accounted for 38.1 of the variance observed on the clinician-administered PTSD Scale (Blake et al., 1990). The major neurological features of Down's syndrome are developmental delay and severe, diffuse muscular hypotonia, which affects most patients. Convulsive disorders are also more commonly present in these patients. The pathogenesis of the convulsive activity in this population is probably multifactorial and may result from a combination of medical risk factors and inherent neurological abnormalities. As individuals with Down's syndrome age, however, other neurological signs may appear. About 20 percent of patients complain of neck pain or discomfort, and they may demonstrate torticollis, gait impairment, or corticospinal tract dysfunction. 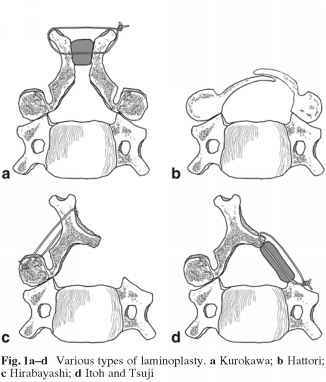 These features are believed to be related to atlantoaxial subluxation and instability and result in compression of the medulla and spinal cord. Figure 13-3 presents images from a CT scan of an 85-year-old woman with severe neck pain and occipital neuralgia. The pain had been progressively worsening during the past 12-month period despite analgesia. Past medical history included hypertension, hypothyroidism, and osteoarthritis resulting in bilateral knee arthroplasties. On physical exam no weakness or evidence of myelopathy was detected. Dynamic imaging revealed a C1-C2 atlantodens interval of 4 mm in neutral, increasing to 5 mm in flexion and in extension. CT imaging (see Figure 13-3) demonstrated gross evidence of atlantoaxial instability including pannus. The patient received temporary relief with a greater occipital nerve block. Because of the overwhelming disability attributable to her neck pain and occipital neuralgia, the patient was considered for surgical intervention. This is a controversial entity whose existence has been questioned. Pain from cervical structures is referred to the head through the C1 to C4 cervical roots. Accepted causes of head pain from the neck include developmental abnormalities, tumors, ankylosing spondylitis, rheumatoid arthritis, and osteomyelitis. Controversial causes include cervical disc herniations, degenerative disc disease, and whiplash injuries. y Occipital neuralgia is thought by some to occur as a result of an injury to the occipital nerve, which may be vulnerable to compression as it passes through the semispinalis capitis muscle. Referred pain of cervical origin has often been referred to as occipital neuralgia, modifying the definition of this disorder. The prevalence of cervicogenic headache and occipital neuralgia is unknown. Risk factors include whiplash injury. Spontaneous dissection of the vertebral or carotid artery may produce head pain. The diagnosis should be considered in individuals reporting new onset of head pain along with neck pain. Clinical suspicion should be raised if the patient endorses a recent history of known provocative factors such as chiropractic manipulation, severe vomiting, or neck trauma, including whiplash-type injuries. Patients with collagen vascular disease or fibromuscular dysplasia are at particular risk. The headache tends to be ipsilateral to the side of dissection. Clinically, CTTH is a featureless, low level headache that is never severe and generally lacks migrainous features. The ICHD-2 criteria do not call for neck pain as a criterion, a frequently mistaken quality ascribed to this diagnosis. Location does not define tension-type headache (TTH). Major trauma is the other possible cause of cervical instability. Radiography or imaging studies are not routinely needed for patients following whiplash or trauma, but it should be noted that a plain x-ray might miss significant bony injury (Barnsley et al. 2002). Serious injuries do occur during motor vehicle accidents, but these are rare and should be detected at the time of the accident (Robertson et al. 2002). Currently the most common way of investigating subluxation instability in the upper cervical region is by x-ray, with measurements taken of the atlas-dens interval in flexion, neutral and extension (Cattrysse ei al. 1997). Individuals frequently awake with neck pain, presumably arising from end-range or awkward positions of the head and neck assumed and maintained during sleep. Derangements can arise in this way and symptoms will persist for a few days or more and be accompanied by restricted painful movements. 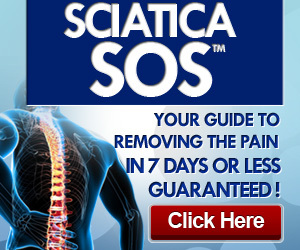 Pain from cervical postural syndrome fades away once the individual gets up, and there are no effects on movements. However, this may occur regularly if the person sleeps in an awkward position that sustains the neck in an end-range posture or uses unsuitable pillows.